Note: 2014 to 2018 " Street Glide Special " and 2015 to 2018 " Road King Special " need an H4 to H9/H11 wire harness to install the headlights. Please search B07B2PZ4TL to find it. Super Bright: DOT SAE, E-Mark Approved. 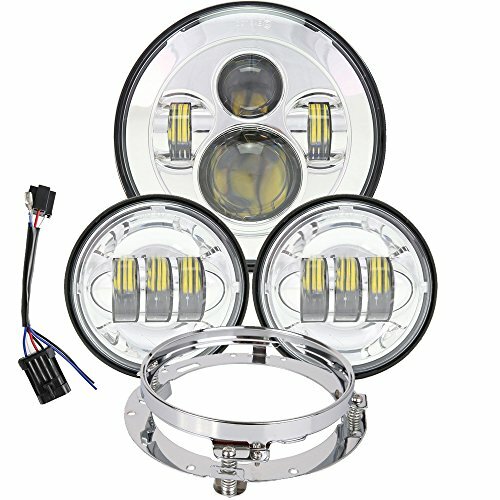 With high grade Cree LED chip, much brighter and durable than other headlights. 4000lms on high beam and 2600lms on low beam.Really light up the road for safer driving. 6000K pure white light. Easy to Install: Plug and Play Design. Usually only take about 20 minutes to install the lights. 30-day money-back guarantee for any reason and 1 year warranty. Durable: Made of Polycarbonate lens which is more resistant than other headlights with fragile PMMA. With IP67 waterproof protection grade. If you have any questions about this product by TRUCKMALL, contact us by completing and submitting the form below. If you are looking for a specif part number, please include it with your message.